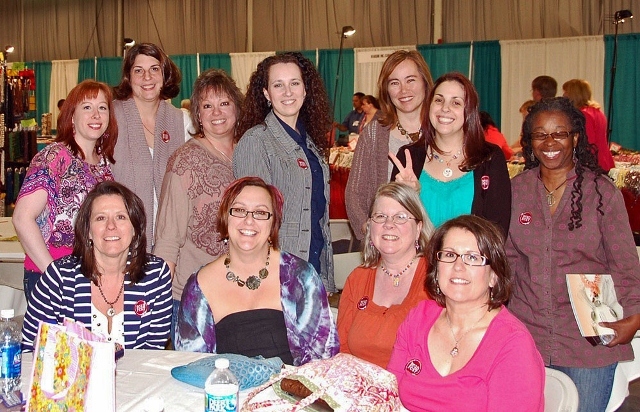 On the weekend of April 14th and 15th, I had the pleasure of attending the Bead Fest Spring show in Philadelphia. A group of jewelry designers and bead artists from the beading community got together for an art bead swap Saturday afternoon at the show. The swap was hosted by my friend, Diana Ptaszynski of Suburban Girl Studio. Diana organized the whole event and she even planned a dinner for us afterwards. What a treat! A ceramic flower pendant from The Classic Bead, a yellow flower button from Jennifer Jangles, a copper clay pendant from Kristi Bowman, two lampwork glass beads from Radiant Mind, a lampwork focal bead from Scott Parrish and a ceramic pendant from Marti Conrad. I can not wait to play with these beautiful goodies. Linda really spoiled me with this stash of art beads! Later on, Diana drew our names, again for some door prizes. 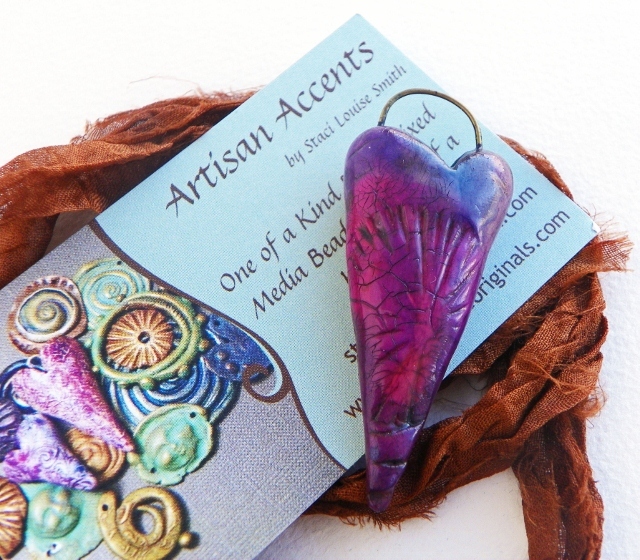 I won this gorgeous polymer clay heart pendant from Staci Louise Smith. I love the color and I already have an idea for a necklace! Staci was also there at the show and she joined us for our art bead swap. It was so great to meet her. She is really a friendly and super FUN girl. I'm looking forward to seeing her again next time! Standing: Me, Lorelei Eurto, Jan Onipenco, Nancy Schindler, Cindy Wimmer, Diana Ptaszynski, Vanessa Gilkes. Sitting: Melinda Orr, Staci Smith, Linda Landig, Linda Hanes. It's so nice to meet these ladies in person and make a solid, real-life connection. Isn't that what we are all looking for in the end? A connection. I tend to think so. I had a blast with each and every one of these ladies here. They are all truly a joy to be around! I walked away 100% satisfied with my trip to Philadelphia. I'm looking forward to next time already. And speaking of next time, please join us! 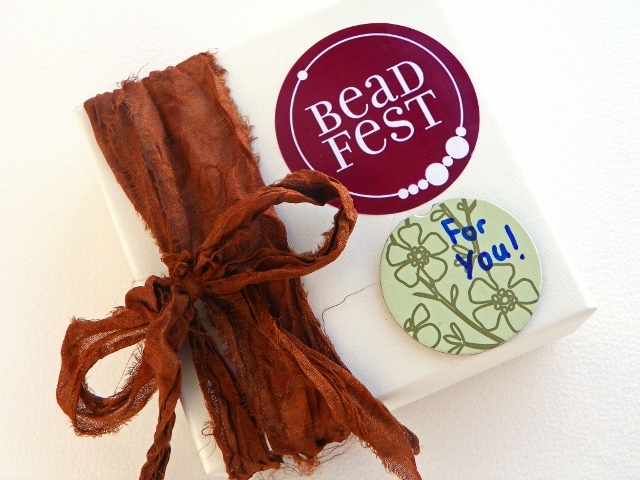 Consider attending Bead Fest Summer in August! If you'd like to join the art bead swap, just contact our host, Diana and let her know you are coming. See you there! Erin Siegel is a jewelry designer, beading instructor and co-author of the forth-coming jewelry book, Bohemian-Inspired Jewelry: 50 Designs Using Leather, Ribbon and Cords. To find out more, visit her blog, Erin Siegel Jewelry. It was a wonderful weekend! I'm so glad you came down...I wish we all lived closer. BTW, you got some GREAT beads! I was trying so hard to keep things moving along I never got to see what everyone swapped, lol! Can't wait til August! Erin, I'm glad I could be your swap partner and that we had some time to visit on Saturday before the others arrived. You captured my feelings exactly--it IS about connection! I am grateful to be connected to you and the others that were at Bead Fest. Looks so fun! I will be there in Aug! My swap partner was Melinda Orr, and her beads will cause me to stretch and grow. I had so much fun with the ladies. My swap partner for Beadfest was Melinda Orr, her beads will cause me to stretch and grow. I had so much fun with thease lovely ladies. I'm so jealous of all the fun y'all had this past weekend. As I traverse the blogs I'm seeing so many pretties and even more wonderful friendships being formed. I had a great time even if it was only for a few hours! It was terrific meeting you and the other ladies. Your bead swap beads are gorgeous. I cant wait for the new book! A good time was had by all that is obvious! I'm so tickled Linda included one of my components for you, I can't wait to see what you create with it! How fun! You sure know how to bead party. 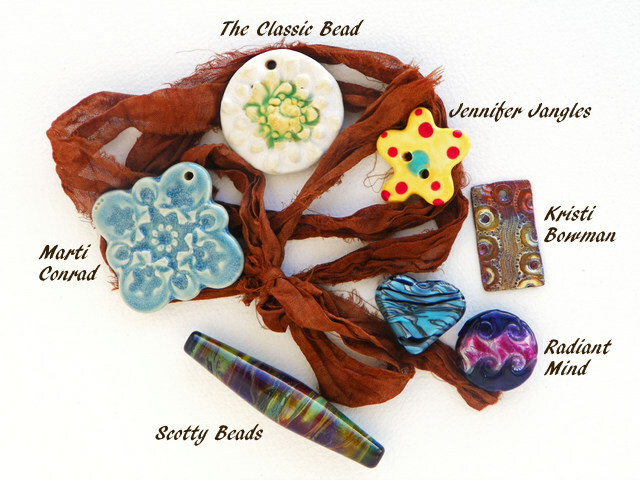 I love the name of the group East Coast Bead Mafia :) Great post Erin! Erin, I sure enjoyed reliving the weekend by reading this post! You are so right...it's not just about the beads, it's about the friendships that go along with them. There's nothing like meeting our online friends in person! It was such a treat to finally meet you and all of the ladies pictured. The swap was great - enjoyed having Lorelei as a partner. Unfortunately I'll miss you guys in August (big deadline that week, *wink*wink*)....but I'll see you in September at ArtBLISS! I agree Paul - guys if you are out there, say hello. Beads unite all! 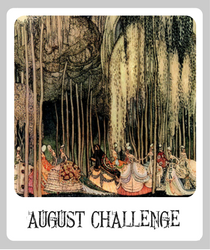 Start a blog - join in the challenges and facebook group Creative Bead Chat.